This is what the student has been waiting for—a chance to play fast. “Now I can really show off!” Then we tell the student, “The first lesson in playing fast is … slow practice.” We’ve just taken the wind out of their sails. Well … almost. There are secrets to playing fast. And if we let students in on these secrets, they are usually more than willing to go through the necessary paces to achieve fast playing. It is tempting to push for virtuoso playing when we see potential, but pushing into big repertoire almost always backfires if we fail to ramp up through prerequisite stages. In fingerwork, for example, the student must develop coordination that allows instantaneous contraction followed by relaxation, and precise contraction that does not also tense up neighboring muscles. This takes time to develop and requires specific practice routines. Virtuosity cannot be forced; virtuosity unfolds from well-practiced repetitions that are based on correct information and appropriate monitoring. 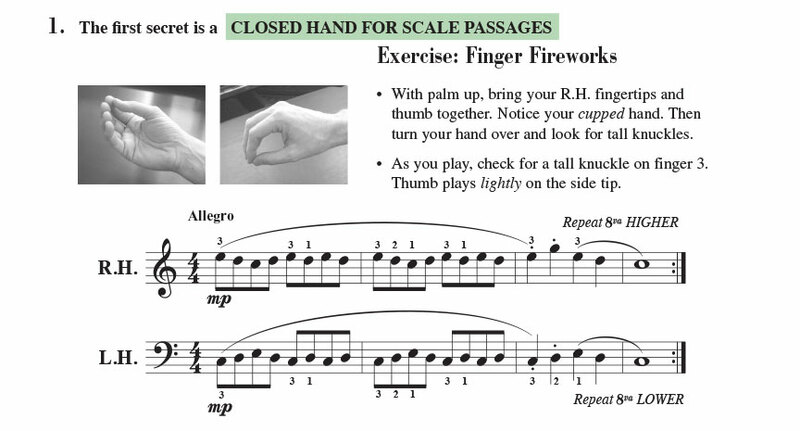 The Level 3B Lesson Book includes Beethoven’s Rage Over a Lost Penny, providing a review of cut time. 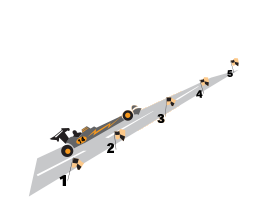 Why does cut time so effectively increase speed? Because it invites pulsing every two beats instead of pulsing every beat. Consider a set of four eighth notes. If we provide a metric pulse on both quarter-note beats, the passage bogs down with heaviness, as if running with boots in the sand. If we pulse only on the first of the four eighth notes, we get fluency and musicality. Measure 3 invites a drop of arm weight into the first of the four eighth notes (beat 1) and a wrist float-off at the end of the slur (beat 3). Match this “down-up” motion in the left hand. The four quarter-note chords are played as “DOWN-and-UP-and.” The down-up motions match that of the right hand and the “ands” are played with a light ripple. Notice how the half-note pulsing of this down-up gesture matches the feel of cut time. It propels the beat, not only through half-note pulses, but from measure to measure. Rotation refers to the back-and-forth turning of the forearm, as if turning a doorknob or a key in a lock. The efficacy of forearm rotation is that it plays two notes with the effort of one. In Interval Review the tenuto notes are played with the forearm rotating toward the thumb and the recurring Cs are played effortlessly on the rebound. The many notes of the passage are thus reduced to a simple descending major scale. Efficiency is gained by employing the natural fall of a turned hand and its rebound. What do pulsing, rotation, and slur gesture have in common? All of these techniques carry many notes on a single impulse. This gives efficiency and motion, technical fluency, and musical artistry. So, how do you practice slowly, yet execute the gesture? The simplest way is to use slow practice to exaggerate the gesture. Slow practice just for finger work has limited workability because the gesture required for speed and expression may be absent. Bringing the gesture into the slow practice makes slow practice exponentially more valuable. Sometimes you need to “sprint” with a passage to find the gesture, then execute it in slow motion. With a facile technique, this can all be done in very little time. But students need yet to develop a facile technique. Developmental steps need to be taken to build fundamental finger coordination. For students at the early stage, the firing of a finger generates many contractions in a generalized area. Specificity is weak; generalized tension is high. Slow practice can provide a relaxation immediately after the note is played, thus allowing the inappropriate contractions to relax. Over time, generalized tension diminishes and finger contractions become very specific with concurrent relaxation of proximate muscles. This is how slow practice, done correctly and over time, can build the neurological basis for speed. In Piano Adventures®, we accelerate the development of this sophisticated neurology through specially developed exercises. We help build “fast fingers” by incorporating the process of “play-relax” with slow practice and repetition. (See the Technique Secrets of Levels 2A and 2B.) Adding the correct gesture provides the formula for expressive virtuosity. We open the Level 3B Technique & Artistry Book with a secret called “Closed Hand for Scale Passages.” Here we contract the hand, bringing the fingers close together with visibly tall knuckles. This contracted position allows the arm and bridge of the hand to align with the finger that plays. We avoid any angle between the playing finger and arm, preferring straight alignment. In this way the weight of the arm can transfer finger-to-finger for efficiency and evenness of touch. The contracted, closed, cupped hand invites continuous alignment through stepwise passages. A slight adjustment is made by the wrist and forearm for each finger being played. You can easily check the alignment at any time by touching the thumb to the tip of the playing finger, then releasing. This brings the hand (with its tall knuckle) and the forearm into balance over the fingertip. This is an advanced application of the Primer Level technique-secret “Making Os,” which builds a firm fingertip. At Level 3B, the “closed, cupped” hand‑shape essentially brings the “O” to the keyboard for effective passagework. We’ve discussed arm weight at previous levels. But efficient playing also utilizes what we call the “uptouch.” Here the hand springs from the surface of the key, with active fingers and a thrust of the forearm. The spring of the up-touch sends the hand and fingers to upcoming notes, in precise preparation for the next chord or passage. The touch is effective for either loud or soft chords, and makes a wonderful counterpart to the “drop-touch” of arm weight. In summary, we work slowly with smart practice to build speed. Students want to play fast, so let’s give them the tools to do it correctly. We can harness our students’ motivation for speed to elicit hours of practice. Then students can indeed show off—with flying fingers and the groundwork for virtuosity.